Cheers to California Wine Month with Save Me, San Francisco Wine Co. In California, September is a big month because it is California Wine Month and a celebration of California's annual wine season! It has always been my dream to get to Wine Country in California but until then I will celebrate California Wine Month here in Minnesota as I drink a glass of wine from Save Me, San Francisco Wine Co. In partnership with winemaker James Foster, Grammy-award winning band Train invites you to raise a glass in celebration of California’s annual wine season. This September, say “cheers” to California Wine Month with the Golden State natives’ Save Me, San Francisco Wine Co.
“Drops of Jupiter” Red, which features a fruity, boysenberry taste. It is great with food or without! “Bulletproof Picasso” Sauvignon Blanc is a fruit-forward varietal with a powerful grapefruit taste. It pairs great with Grilled Seafood or a Greek Salad! This one was my favorite! Soul Sister Pinot Noir is an expressive medium ruby wine with flavors of ripe cherries and strawberries and a smooth finish! It tastes great with an Italian dinner or grilled chicken. I love trying new wines and these wines from Save Me, San Francisco Wine Co. were unique, delicious and I loved each one! If you are looking for a taste of California and a unique wine taste, I highly recommend Save Me, San Francisco Wine Co. wines. 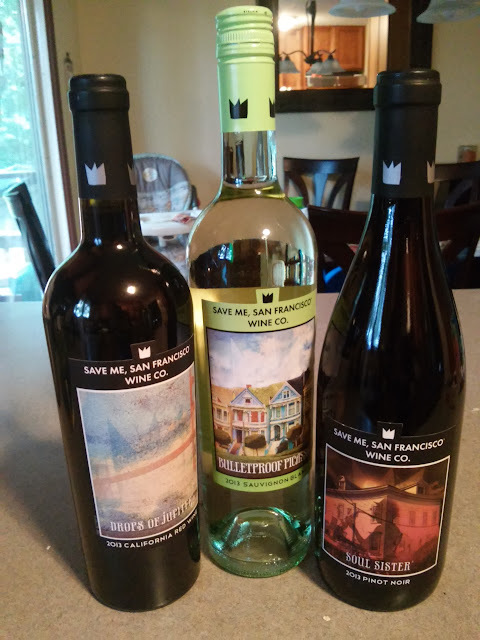 You can purchase Save Me, San Francisco Wine Co. online or at a retail store near you.